Portable Antiquity Collecting and Heritage Issues: "Five Artifacts, Stolen by ISIS from Palmyra Museum, Recovered"
"Five Artifacts, Stolen by ISIS from Palmyra Museum, Recovered"
"Five Artifacts, Stolen by ISIS from Palmyra Museum, Recovered" scream the headlines (Hamda Mustafa, Syria Times Saturday, 09 April 2016). 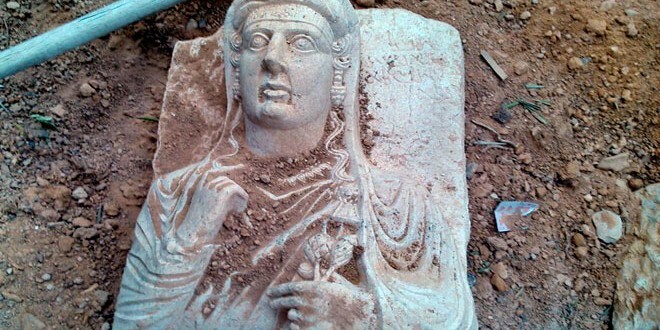 Competent authorities on Saturday found five artifacts previously stolen by ISIS terrorists from the National Museum of Palmyra upon their attack on the city. 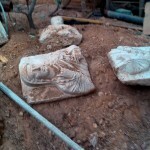 According to a source in Palmyra, the artifacts were found buried inside a house in al-Maalef area in Palmyra during a combing operation in the historical city. 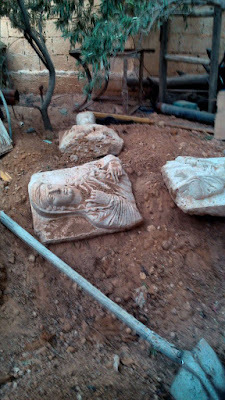 The artifacts will later be handed over to the General Directorate of Antiquities and Museums, the source told SANA. 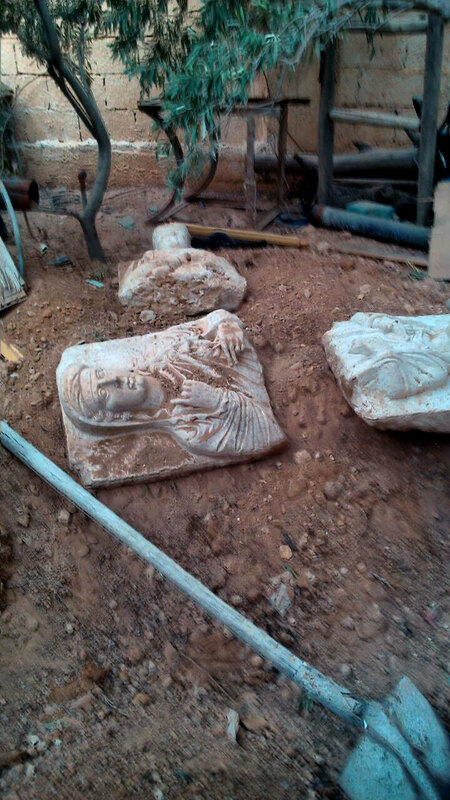 ISIS terrorists, upon controlling the city, looted a large number of archeological pieces and relics from Palmyra and smuggled them abroad. Except the bust shown looks to me like a fake. If they were "buried in a house", how is it known they were "looted from a [or 'the'] museum" and not freshly dug-up or freshly-made? The burying and recovery of the items was not very convincingly staged either, probably the ground was too hard for the fakers to dig a real hole, so they threw the pieces down in a wide but shallow scrabbled hole and posed them next to an old cement-covered shovel. I am not convinced that this is "evidence" of anything at all. "That'll do guys, Hamid, take the photo..."